Happy Friday everyone. We hope your week is ending well. Today we thought we’d bring up choices. 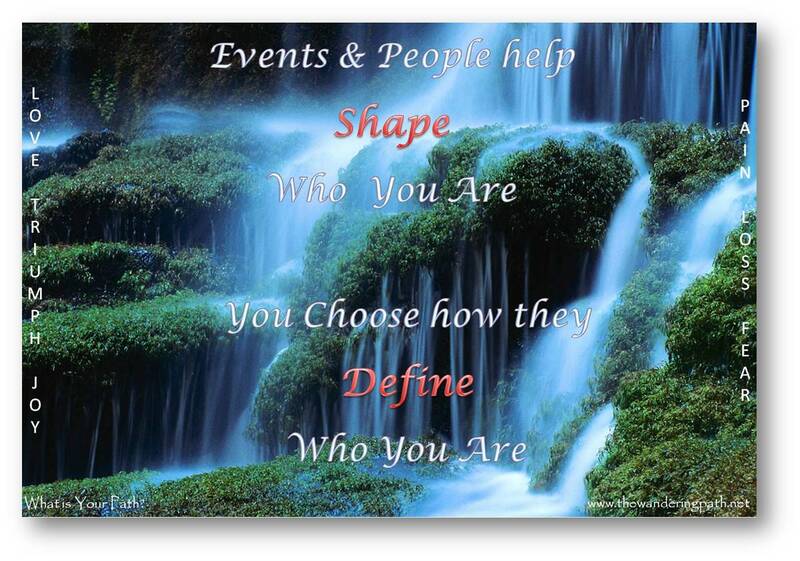 Everyone has events and people that influenced and help shape who they are…but whether good or bad, the choice is yours how those events and people…Define…who you are. Just as nature is shaped by events and by people..it adapts to still continue to grow, flourish, and provide for those that depend on it…perhaps you should too. Be who YOU are…find your path…whether you are searching for health, happiness, inner peace, joy, adventure….or something else..it is yours to choose and yours to find. Blessings to you all on your paths. 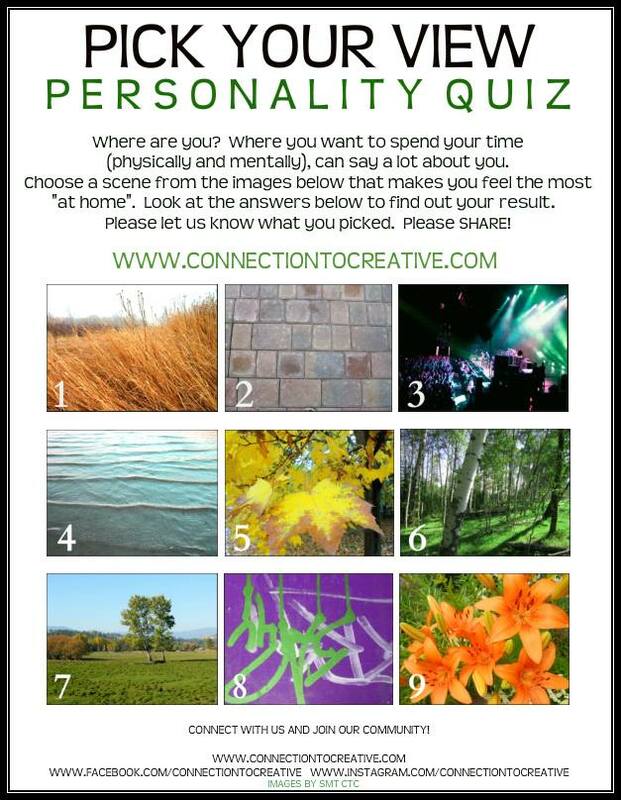 Connection to Creative provided another Personality insight graphic that we found interesting enough to share. Where is your haven? Your favorite place? Ours did vary but all were very interesting and prompted discussions; especially when we thought about how some of our choices have changed over time from where we would have chosen when we were younger..to what we chose now. BB to you all and hope you find this as interesting as we did. Where are you? Where you want to spend your time (physically and mentally), can say a lot about you. Choose a scene from the images that make you feel the most “at home”. Look at the answers below to find out what you picked. Feel free to SHARE with your friends and family. The field of grasses blowing in the breeze is a wonderful example of life and the organic twists and turns it makes. You are an intelligent person that has a soulful side. You enjoy time alone to think about all that goes on in your life. MESSAGE: Life can be positive and negative, dark and light, happy and sad. It is only when you can learn from each side of the coin, that you become enriched with more positivity. Above all else, the act of ‘giving’ is an extremely important way to enrich your life. When you give, you connect to an important appreciation for life’s situations, the natural abundance that is always around you and the lessons that life teaches you. TIP: It is time for you to actively work on your emotional healing. 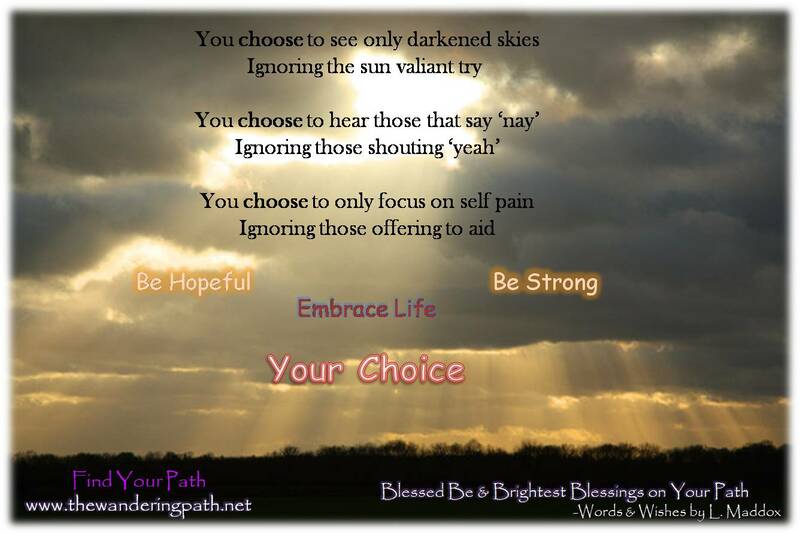 Don’t be afraid of dredging up old unresolved pain or discomfort. It is only when unresolved feelings surface, that you can shed them for good. 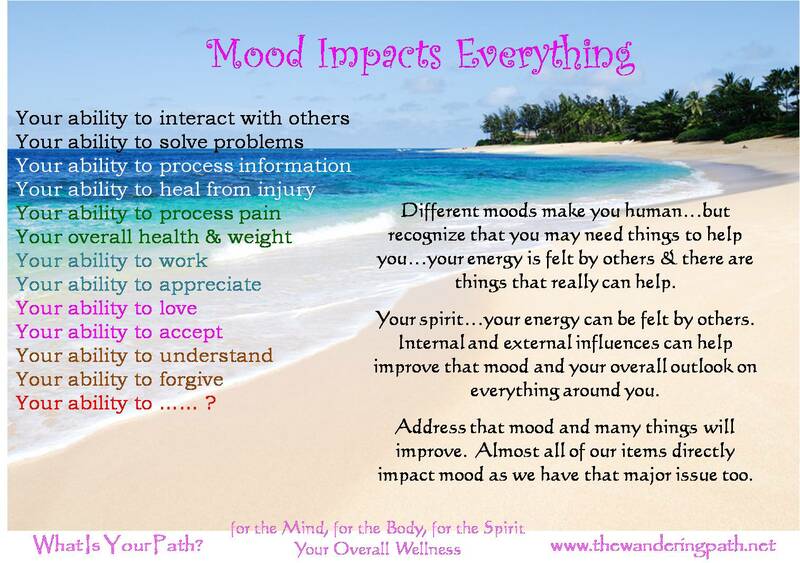 Effective emotional healing can completely free you. The bricks that you walk on are there to support you. Life as well, will support you. You are an individual that could use a boost to the spirit, for you are easily weighed down by your outside world. MESSAGE: It is time for you to conquer your fears and move up in all aspects of your life. Whatever it is that you currently have hesitation with, know that there is always a positive way to approach it. Stop looking towards the ground and hold your head up high. Deep down, you are a very strong person; you just have to believe that you are strong in order to get ahead. The most powerful thing that you have is your mind. Worrying is not good for you; for it depletes your creativity, personality and overall zest for life. Know that whatever you worry about or have hesitation with, the universe will support you. Just believe that it will. TIP: Know that when you feel stuck, in a rut, or confused; things are always changing and moving. There is no “being stuck”. When you identify that you feel that way, it can be one of the best things for you, for then it can become a time of transformation. Lights, music, excitement. You are an individual that likes to have their creative side sparked. You love the rush of a crowd of people, but also like to be seen and heard. MESSAGE: It is important for you to remember that your creative spirit is not just triggered by the rush of sound or an amazing visual performance. An untouched natural environment is the number one provider of a creative charge. It is connection to creativity. It is connection to the divine. Right now you have to focus on your connection with nature and your connection with yourself. Focus on creating a healthy balance in your life between your work, family, personal tasks and the outdoors. Turn to nature when you are feeling lost. Nature is “creation”. Nature is home. TIP: The best way to live creatively is to allow yourself to express yourself in every single way. Do not hold anything back. 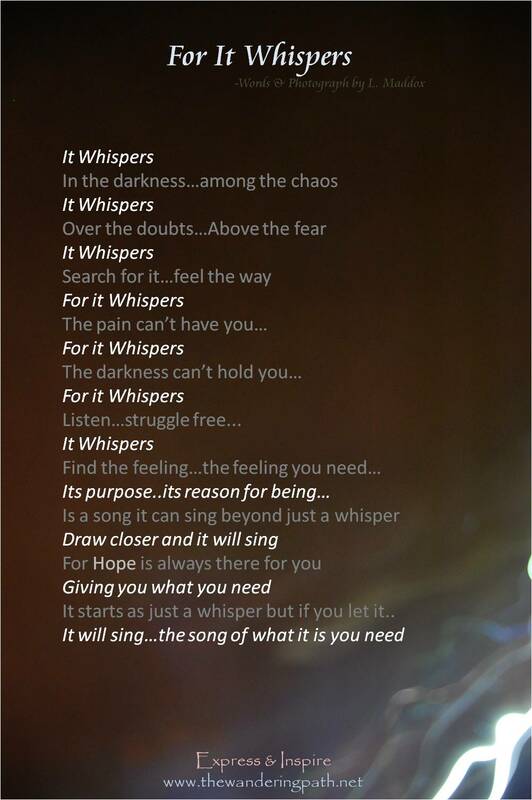 If you feel like singing; sing from the rough top. If you feel like dancing; dance in the street. Remember that nature never holds back anything. Calm, cool serenity. The simplicity of a body of water is one of the most meditative and healing environments you could put yourself in. 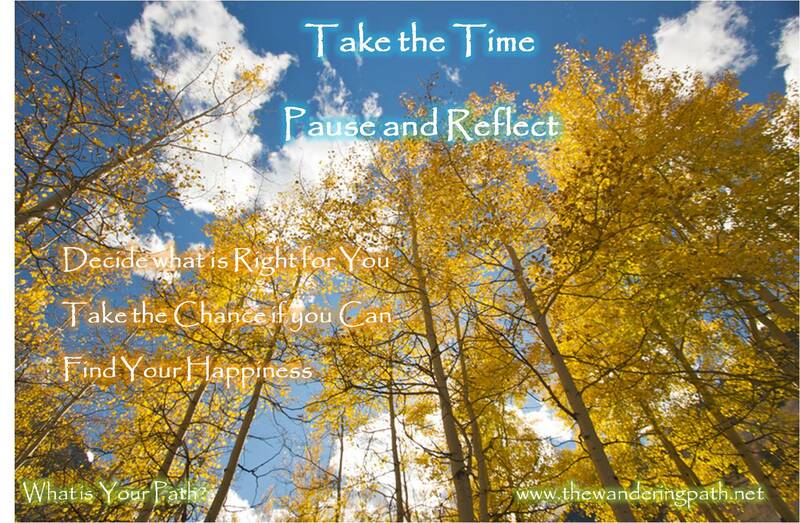 Your mind and body is asking you to give it more time for peace and contemplation. MESSAGE: It is time for you to truly listen to what your heart is telling you to do. When you listen to your heart and live authentically, your spirit grows stronger and you become more connected to the outer world. Use your intuition. Everything is energy and therefore everything is connected. Do not doubt your inner messages. They are usually correct. There are signs all around you. Be open to receiving all of life’s messages. The beautiful leaves of autumn are the essence of new beginnings to come. There is a sense of richness, fulfillment and accomplishment; within the leaves around you that are changing color. MESSAGE: You need to take a break from a few things. Whatever it is that has been draining you from all of your sleep and energy, you need to take a break from. Let someone else take care of those things for a while. Focus on what it is that you truly want to work on. What is it that makes you feel accomplished and creative? It is important for you to have balance, yet feeling as though you are trapped into doing everything, is very unhealthy. Let someone know that you need help. TIP: Allow yourself to be moved to take on any CREATIVE tasks that you feel connected to. Don’t hold back on something because you feel that it is not right for you. If you wake up one morning and feel compelled to start knitting with bright yellow wool, just do it! You never know what will happen. Allow yourself to be guided by spirit. The life and energy within a forest is the most untouched, highest vibration, spiritually charged energy that you can find. You are an old soul that desires more personal time to reflect and create. MESSAGE: Know that you are loved. Even if you do not have anyone around you telling you, you are. You are loved by the entire universe. If you feel alone or that people do not understand you, there is no need to despair. Energy is creation. Creation is love. Creation is YOU. When you send love out into existence, you will receive love back. Try sending love out to everyone you know. If you do not know anyone; send love out to the trees, plants, animals or people in general. You WILL receive love back. Your creative juices will flow trusting that you are eternally loved. A beautiful day in a calming and pleasant pasture. The beautiful blue sky shows no worry to any storms ahead. You are an individual that loves to feel secure and safe, rarely straying from your usual routine. MESSAGE: It is time you worked on creating your best life! You have the power to do anything and everything, all you have to do is try. Figure out what it is that you want to feel. Do you want to feel love, health, wealth? It is not about ‘thinking’ about what you want to have, it is about ‘feeling’ what you want to have. When you truly feel it, it will be yours. TIP: When you set intentions of how you want your life to feel, you are sending that message out into the universe, asking for it to happen. When you feel strongly enough about your intentions, they will surely manifest in some way. You have to be specific. This image of graffiti is creative and yet burdening to some. This scene is a perfect example of someone’s creative escape. When people see graffiti, they either gaze in awe of the intricate creativity that is displayed before them, or they frown at the defacing of their streets and buildings. You are an individual that occasionally feels mixed up inside about issues that lay before you. MESSAGE: You need to become more open minded when it comes to other people’s point of view. Not everything is black and white, nor should it be. You must make decisions based on seeing every situation from all angles. It is the only way to go about something in a fair way. Are you going to look at an issue as a burdening problem or beautiful artwork? TIP: Really come to terms with what it is that you value and appreciate in your life. Reaching out and connecting with others will broaden your understandings to many different subjects. Take all the advice that you can get, however it is up to you to do your homework when making your final decisions. Picture perfect lilies symbolize contentment. You are someone that enjoys feeling as happy and at peace as you can. You are always busy with the day to day activities that keep your eyes on what needs to get done. You are often so caught up with your to-do lists, that you never stop and let life just happen. TIP: No matter how hard life can get at times, don’t give up. The best day of your life might be tomorrow. A flower always has to go through an important period of growth under the dark soil before it emerges into an amazing beautiful creation. Every creation has stages of growth. Another interesting post by the Connection to the Creative and we wanted to share for those that do not have Facebook. The picks around here were 1, 2, 4, 7, and 9. Happy Pondering -The Wandering Path Staff. 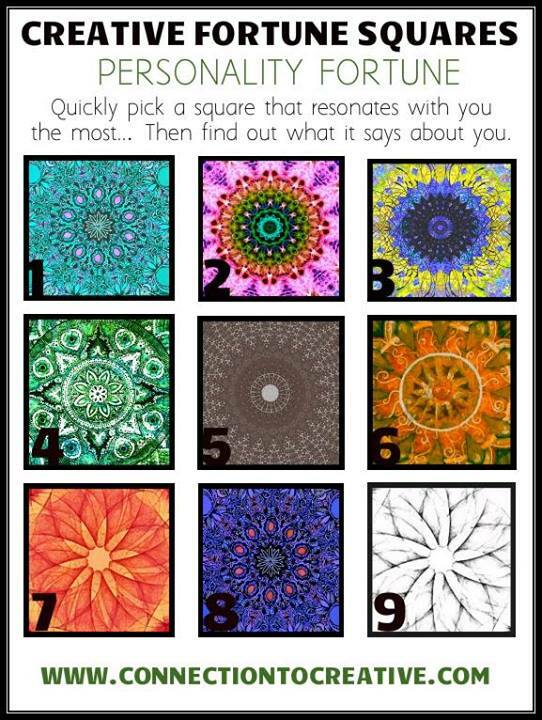 Quickly decide what creative square resonates with you the most. 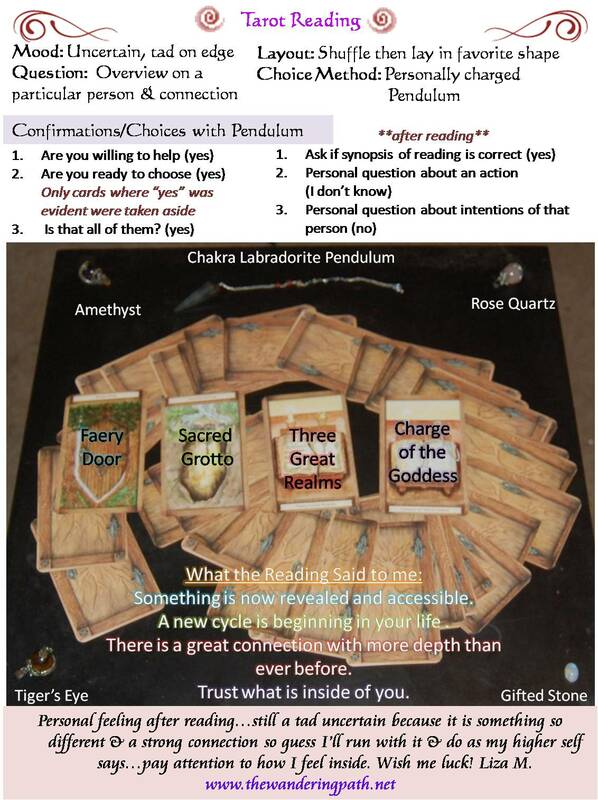 Read below for the answer to the fortune square you have chosen. 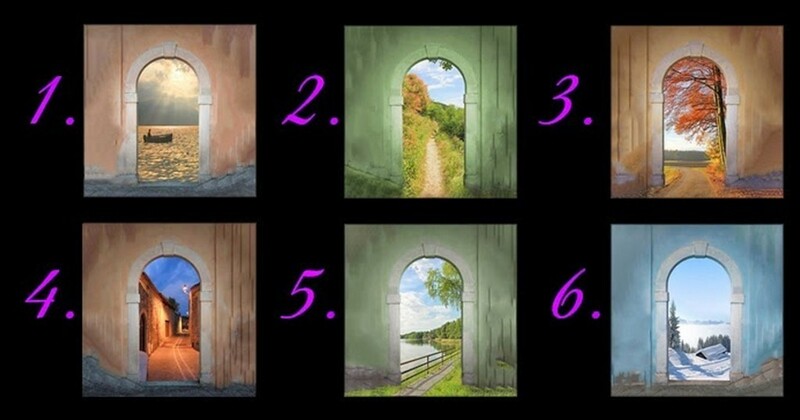 Let us know what door you picked and if the answer was accurate for you. Feel free to SHARE! 1. It is time for you to conquer your fears. Whatever it is that you have hesitation with, know that there is always a positive way to approach it. You are a very strong person. You just have to believe that you are, in order to get ahead. The most powerful thing that you have, is your mind. 2. It is time for you to simply surrender to life and let the path you are traveling on unfold before you. Don’t be worried about what your next move is. Only when you worry, do you create obstacles for yourself. Let life happen. Only when you do this will you find everything you need along the life path you are walking. 3. Right now you have to focus on your connection with nature and your connection with yourself. Focus on creating a healthy balance in your life between your work, family, personal tasks and the outdoors. Turn to nature when you are feeling lost. Nature is “creation”. Nature is home. 4. You need to become more open minded when it comes to other people’s point of view. Not everything is black and white, nor should it be. You must make decisions based on seeing every situation from all angles. It is the only way to go about something in a fair way. 5. It is time you worked on creating your best life! You have the power to do anything and everything, all you have to do is try. Figure out what it is that you want to feel. 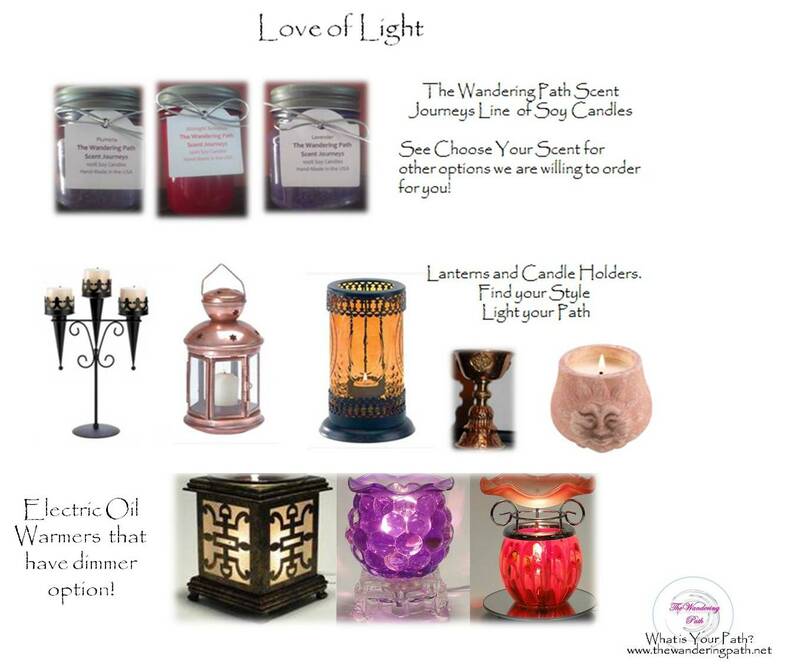 Do you want to feel love, health, wealth? It is not about thinking about what you want to have, it is about feeling what you want to have. When you truly feel it, it will be yours. 6. You need to take a break from a few things. Whatever it is that has been draining you from all of your sleep, all of your energy; you need to take a break from. Let someone else take care of those things for a while. Focus on what it is that you truly want to work on. What is it that makes you feel accomplished and creative? It is important for you to have balance, yet feeling as though you are trapped into doing everything, is very unhealthy. Let someone know that you need help. 7. It is time for you to truly listen to what your heart is telling you to do. Use your intuition. Everything is energy and therefore everything is connected. Do not doubt your inner messages. They are usually correct. There are signs all around you. Be open to receiving all of life’s messages. 8. Life can be positive and negative, dark and light, happy and sad… It is only when you can learn from each side of the coin, that you become enriched with more positivity in your life. This is due to developing an appreciation for all of life’s situations and the lesson they teach you. 9. You are loved. Even if you do not have anyone around you telling you, you are. You are loved by the entire universe. Energy is creation. Creation is love. Creation is YOU. When you send love out into existence, you will receive love back. Try sending love out to everyone you know. If you do not know anyone; send love out to the trees, plants, animals or people in general. You WILL receive love back.